South Korea’s smallest mobile carrier, LG Uplus Corp., said Monday it has agreed with Nokia to join hands in developing the fifth-generation network technologies, which is set to emerge as the new industrial standard in the near future. 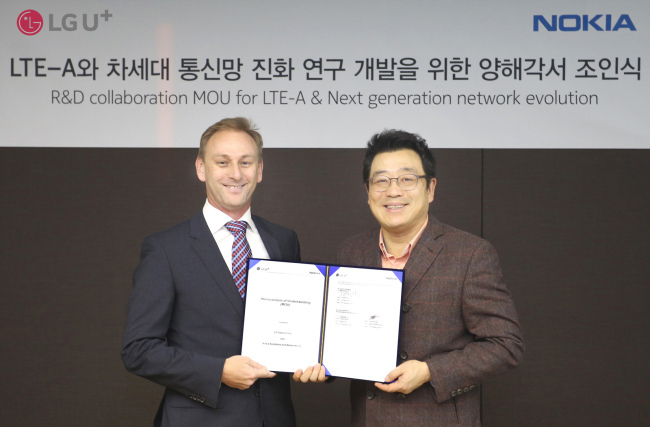 Under the memorandum of understanding, LG and Nokia will cooperate in developing technologies related to the long-term evolution advanced and 5G networks, and also seek to find more efficient ways to transition from LTE to more advanced networks. The two will also verify and test the new network together and roll out various joint projects together, LG said.